It can be difficult, with so much money and attention focused on HQ2, SLU and the waterfront redo, to remember those 30 humble and once-neglected acres up above the freeway. 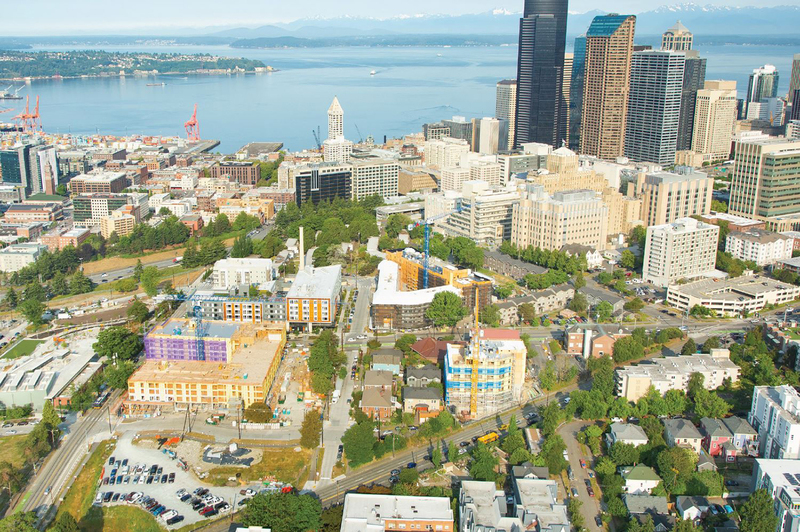 Yet the redevelopment of Yesler Terrace is fully underway, with a half-dozen sites in play. Seattle Housing Authority estimates that, at the end of last year, it had about 2,000 units in the pipeline. Over 600 are now completed. One thing I noticed during a quick visit in May? It’s becoming impossible to park up there — always a sign of economic vitality. Contractors’ pickup trucks, machinery and dumpsters dominate the curb. Yesler Terrace Park just opened, designed by Site Workshop, and there’s a new diagonal pedestrian connector that connects the dead-end of Ninth Avenue to Yesler Way below. Some day it’ll be a pleasant ramble from First Hill down to Jackson. SHA estimates that eventually it will have about 1,700 units of permanently affordable housing in Yesler Terrace. SHA’s ultimate goal, with private partners, is to replace the 80-year-old low-rise buildings, originally with about 561 units, with 5,000 apartments. Some of the new affordable units will sunset back to market-rate after 20 years, under terms of the city’s multifamily tax exemption program (MFTE), so about 3,200 units will end up being market-rate. But SHA estimates that, when all’s said and done, it will have about 1,700 units of permanently affordable housing. Also possible, but by no means guaranteed, are up to 900,000 square feet of offices, possibly a hotel and 88,000 square feet of retail. Thus far, new apartment projects by Vulcan Real Estate, Mill Creek Residential Trust and Lowe Enterprises have mainly been the focus — with small amounts of retail included. Seattle Housing Authority is keeping and developing the parcel at 1001 E. Yesler Way. The plan, by Hewitt, is for 127 affordable units, a small office, and underground parking for 67 vehicles. The building will range from five to seven stories in height. Hinoki — a variety of Japanese cypress tree — will have its first design review at 6:30 p.m. Wednesday, Aug. 29 at Seattle University’s Admissions & Alumni Building, 824 12th Ave. 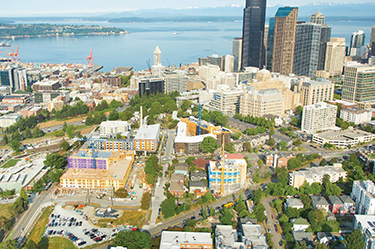 The 1.1-acre site is on the southeast corner of Yesler and 10th Avenue South. It’s also variously referred to as Block 5.1, Block 5A and 110 10th Ave. S. Three two-story buildings with 23 units were removed in late 2017. The team also includes Andersen Construction, general contractor; Pyatok, associate architect; Coterra Engineering, civil; PCS Structural Solutions, structural; and Tres West Engineers, MEP. Vulcan is preparing its third Yesler Terrace building at 1000 E. Yesler Way. The triangular site, generally called Block 4, is the east of three blocks Vulcan purchased for $21.1 million in 2016-2017. Vulcan has said it will invest $200 million in the three projects. On the west block, Batik opened this spring at 123 Broadway, with 194 units. Runberg Architecture Group was the architect, and Exxel Pacific was the general contractor. This is on Block 2, which Batik shares with SHA’s new Raven Terrace. On the middle block, directly across the street, Cypress is now under construction at 120 Broadway. It’s expected to open next year with 237 units. Again, Runberg is the architect, and Exxel Pacific is the general contractor. This is what SHA calls Block 3. Block 4 is bounded by Boren Avenue to the east, and totals about 1.4 acres. The early plan is for a six- to nine-story building. About 52 of the 260 possible units would be affordable under MFTE. The unnamed project hasn’t yet entered design review. During a recent tour of Batik, a Vulcan representative said that Runberg and Exxel Pacific would also be the team for Block 4. SHA is currently evaluating offers for Block 7 and Block 8, on the northwest shoulder of the campus.